With its sleek tufted back and semi-winged seat back, the Arne Sofa brings a touch of elegance to a setting's décor instantly. 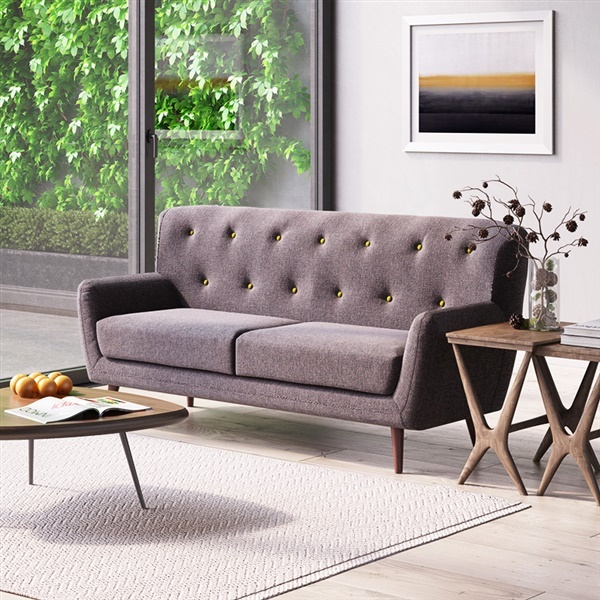 This sofa boasts a solid wood frame and Scandinavian-inspired tapered legs that deliver unparalleled quality. Plus, the sofa offers a soft modern look and a compact design that make it a great fit just about anywhere. Choose a deluxe sofa that is sure to serve you well consistently with the Arne Sofa. Awesome sofa and arrived right on time! couldn't be happier!! This couch turned out to be the perfect match for my gray dining chairs. It took 20 days to arrive, but any time I called customer service to check the status, they were super helpful. The couch is firm but I like that, as I think it will last longer. The one downside for me is that cushions are not removable, so anything that slips through the back will pretty much stay there. I think I will stuff the gap with fabric or similar; I'd hate for my phone to slip in and get stuck. absolute perfection in every way, no complaints whatsoever, just wanted to express my utmost happiness with this amazing addition to my living room! Modern and unique but simple enough to fit nicely in a "neutral" setting like an office - which is what I needed it for. Probably would look very good in a home that focuses more on wall art, sculptures or decor as it isn't extravagant but still has enough style where it complements other more vibrant or abstract pieces nicely. Favorite features on this sofa are the pronounced backrest and the green button accents. Wonderful find, happy to own! dream home complete thanks to this sofa!! It feels so good to finally have my living room complete! This AMAZING sofa was the last piece to bring my dream home to life! It's STYLE and COMFORT blows my old sofa out of the water! THANK YOU!! Best looking and most comfy sofa I've ever owned! Love the look of it in my living room and even better to lounge out on! perfect fit for my studio apartment! really transformed the space into a more modern look! Prosperfect size awesome design ultra comfy! not too flashy looking which i like but has a little extra flair with the button accents, the seat cushions are comfy and the backrest is firm, overall happy with my order! Purchased this in gray with green buttons, the buttons add such a delightful accent to the overall look. The seats cushions are plush and comfortable! Couldn't resist the price so I purchased this for my family room in the light grey with the dark grey buttons. The tufting is a nice subtle detail and the soda itself is comfortable. Customer service is great and I highly recommend Inmod for any and every thing! ProsNice details. Built well. Upholstery is beautiful. Comfortable. Great price. Wonderful purchase, Fabric is soft and cushions comfortable. Bought my mother this couch to replace her old one, she also loves it! Love everything about this sofa. I purchased it in the lighter grey color and it works perfect in my space. Great shape and comfortable. Very happy with the price as well. Button tufting is a nice subtle accent too. What is the material of the cushion covers? Our Arne Sofa is upholstered in a high quality polyester blend fabric. Does this sofa need assembly? The Arne Sofa requires a very simple assembly, which involves attaching the legs to the sofa frame. This sofa is manufactured in top notch facility in China with strict quality control. How firm is the seating area? very firm, firm, a little plush, plush? Can the seating cushion cover be removed for cleaning? The cushions on the Arne Sofa are a medium to firm. The cushion covers can be removed for easy cleaning. The seat height for the Arne Sofa is 17.5"